Fenway Holiday « It's a Kind of a Family. It's a Kind of Insanity. by the wave; he loved the chants, the clapping, and singing Take Me Out To the Ballgame; and although he paid little attention to the action and didn’t understand a thing that was going on, he never got bored. hours (which is 9 hours in 3 year-old time). forever. And I hoped my son would remember it, too. said with alarm, "Daddy, Daddy, we forgot the biggest holiday of all!" We did? 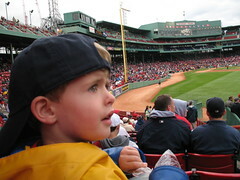 "Yeah Daddy, we forgot Father’s Day at Fenway!" ps, I would delete the trackbacks, they usually only return disgusting URLs…a legacy from typepad version 1.0 that we use for MLBlogs. Hey, Uncle Rob! It’s me, Jimmy! I LOVE your blog. It’s totally sweet!!! Good luck! I’ve voted for you the maximum amount (10). Lookin forward to your next blog! So Rob…We know all about you and your family. What are your plans for what you would accomplish for the fans if you were to be elected? (I was on the first list of alleged finalists…) I’d like to hear your plans. I am also a singer and songwriter and a folk music D-J (25 years worth on a National Publc Radio affililate), so I did appreciate your song. But what are your specific plans for the fans? Blog away!!! What a great memory you have shared with your readers, thanks Rob! Congratulations on making it through to the top 10. 1) Do you have any plans or ideas to make more game tickets available to fans, or any suggestions that the Sox ownership could carry out? 2) Have you looked into the current legislation on Beacon Hill concerning re-selling of tickets? What is your stance? Also, what of the StubHub-MLB alliance? Should the Sox enter into it? 3) Do you have any ideas as to how Red Sox Nation can be united not just socially, but for philanthropic purposes? Yet another example of what being a member of Red Sox Nation is all about. Such a beautiful story. Very nicely written as well!